HOME - The Great NZ Santa Run is a 2-3km fun run/walk in a santa suit! The Great NZ Santa Run is a 2-3km fun run/walk in a santa suit! Our new partner charity the Graeme Dingle Foundation is a leader in positive child and youth development building resilience and self-belief in New Zealand’s young people. The Graeme Dingle Foundations objective is to have NZ’s young people transition through their sequenced programmes from age 5 through to 18 as a transformational journey that sets them up with a strong platform for adult life and a career. Their proven programmes include Kiwi Can, Stars, Career Navigator, Project K and MYND. Sir Graeme Dingle, co-founder of the Graeme Dingle Foundation is thrilled with the opportunity to partner with the Great NZ Santa Run in 2018. “My plan is to make New Zealand the best place in the world for young people and their families by 2050 and I will do everything in my power to ensure that this happens.” he says. “The ‘Growing Great Futures – Whakatipu Tamariki Ora’ report prepared by Infometrics, shows that every dollar invested in our programmes is expected to result in a long-term benefit of $7.15, every contribution that is made to the foundation makes a difference to NZ’s young people.” says Sir Graeme. The Foundation uses the great outdoors; fun and safe experiential learning; inspirational classroom leaders and world-class mentors to help NZ’s young people keep on track, learn good values and set goals for the future. 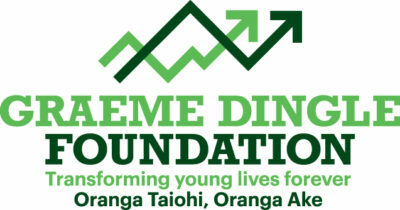 To learn more about the Graeme Dingle Foundation go to www.dinglefoundation.org.nz. Each entrant* receives a free Santa suit as part of their entry fee. Kids under 13 will get a Santa hat instead of a Santa suit. The courses are kept easy so everyone can finish with minimal training and are highly visible for maximum impact. Santa suits are provided as part of your entry, and past years there have been awesome outfits including elves, Rudolph and other festive characters. Santa suits are adult one size fits all sizing. Santa suits are men’s (trousers) or ladies (dress/skirt), top, hat, belt and beard. Kids under 13 years will get a Santa hat. Santa suits are collected on the event day. This fun run is a 2-3 km easy walk or run, designed for any level, and any age. Families, corporate groups or individuals are all welcome! Our recipient charity is The Graeme Dingle Foundations with proceeds from the event going to meeting their objective that is to have NZ’s young people transition through their sequenced programmes from age 5 through to 18 as a transformational journey that sets them up with a strong platform for adult life and a career. Their proven programmes include Kiwi Can, Stars, Career Navigator, Project K and MYND. Started in 2008 by Lactic Turkey Events, the Santa Run has grown from an Auckland only event, to having Santa Runs at the same time and date in Whangarei, Auckland North (Albany), Auckland West (Henderson), Auckland South, Auckland Central, Hamilton, Tauranga, Rotorua, Hastings, Palmerston North, Wanganui, New Plymouth, Gisborne, Wellington, Christchurch, Dunedin, Wanaka and Invercargill. Last year there were over 4,000 Santa’s nationwide and this year we add Blenheim – a total of 18 venues around the country! Lactic Turkey organises a variety of events throughout the year with the aim of getting people into the outdoors. Our events are aimed at people of all ages, fitness levels and skills. We want people to get out and give our adventures a go, relishing the buzz that comes with conquering the challenge. Our professionally organised events inspire a real sense of self-belief in the participants when obstacles are overcome. The common profile of a Lactic Turkey competitor is a person that wants to get into the outdoors to experience life and conquer the physical and mental challenges that inevitably arise. We as event organisers are active in outdoor pursuits and enjoy exploring new places. We also support youth into the outdoors by sponsoring youth events like the Hillary Challenge and Get2Go and organising for the Auckland Council a Secondary Schools Sustainability Adventure Race. Join our mailing list and receive regular email newsletters updating you with the latest information on our events. Click here to subscribe to our email newsletter.